Quick Breakdown: A stellar game where you play as an inspector working at a border checkpoint between your communist country of Arstotzka, and the neighboring country Kolechia, which your country has just recently ended a 6 year war with. 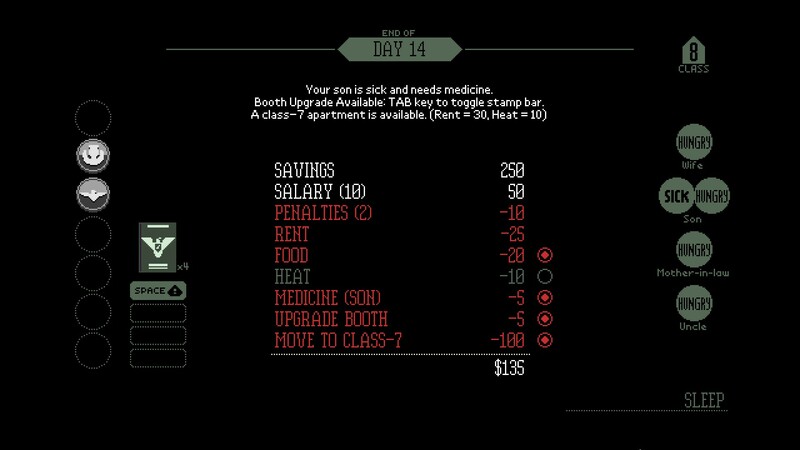 Papers Please is a truly unique game. Admittedly, it’s a pretty tough sell, on paper it sounds like it’d be awful. Even when I purchased the game, I wasn’t really sold on it, but I took a chance on it based on the ravings from my friends, and the low sale price of $2.50. After playing the game, I’m glad I did. It’s even worth getting at full price, but if you're like me and get most of your games from Steam, you'll probably end up waiting for a sale anyway. Don't we all wait for the Steam sales for everything? So why’s it a tough sell? Well, you play as an inspector at a border checkpoint. People give you their papers and you look over them and either let them enter your country, deny them entry if their papers are not all in order, or even detain them if need be. Sound like fun? To me it didn't, but maybe you can see the appeal there. So why is it worth playing? Odd as it may be, that very task I talked about in the last paragraph actually is a lot of fun. But there’s further reason that is even more compelling. You work for the glorious country or Arstotzka, at the checkpoint for the border town of Grestin. The other half of Grestin belongs to the neighboring country of Kolechia, which Arstotzka has just ended a 6 year war with. 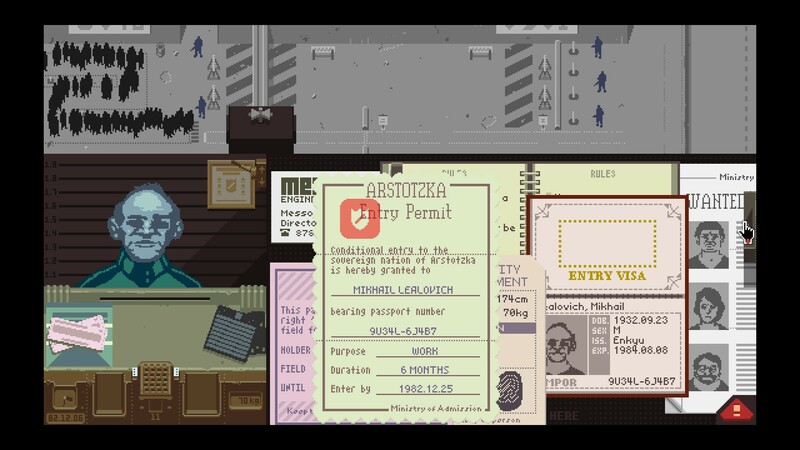 Your border checkpoint has only just opened because of this, and people are once again allowed to enter Arstotzka for the first time in 6 years. This setting, and the people it brings through your checkpoint, and the events it leads to, are the game’s biggest strengths. 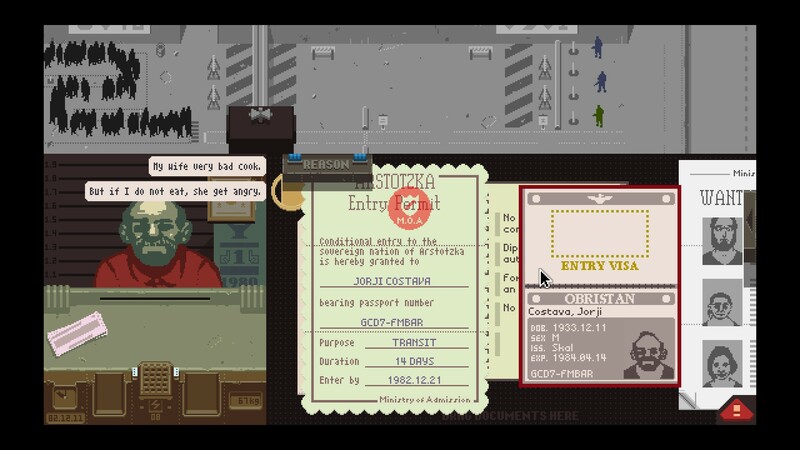 You’ll encounter natives trying to re-enter the country, foreigners who can finally come to Arstotzka to work or visit, or even just pass through. There will also be terrorists, who aim to harm your glorious country, and it is your duty to deny and even detain them. The game’s story and dialogue are both well written. Your actions during the day (the gameplay portion, which we’ll get to in a moment) affect the story between days, and down the road. Both the one time characters passing through, and those who are recurring are interesting, and some even quite memorable. (I think everyone who’s played this game loves Jorji). So what of the gameplay? It’s done in a single screen, divided into 3 portions. Roughly the top third of the screen is a top-down view of the border checkpoint, the line, and the guards. This part isn’t used too often for gameplay. The bottom two thirds of the screen are divided as well, the left third presents a first person point of view from your place inside your border checkpoint. 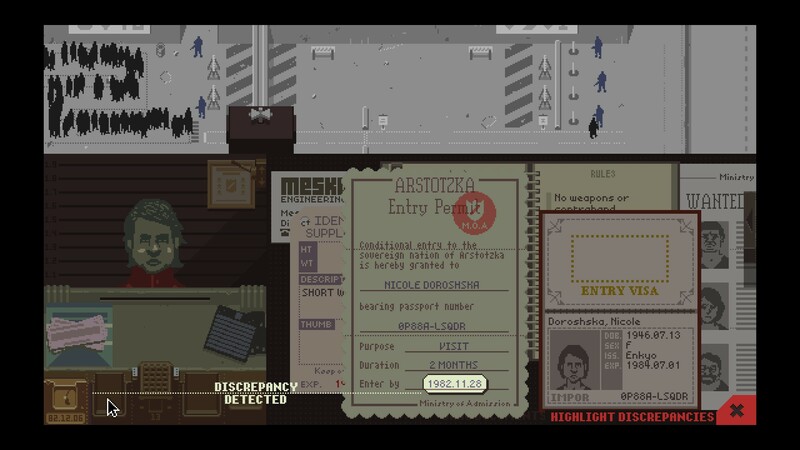 This is where applicants seeking entry to Arstotzka come in and give you your papers. The rest of the bottom portion of your screen is where you can look at said papers up close. At the end of the day you will be paid 5 credits for every person you correctly processed. The first two incorrectly processed applicants will earn you a citation with a warning and no payment, each error after that will also incur a penalty docking some of your pay. Citations are reset at the beginning of each day. During this end of day phase you will also need to balance your finances, and decide if you have money to pay for heat in your apartment, or to purchase food for your family. If you’re not able to take care of them properly they can die. If they’re all dead, or if you run out of money entirely you’ll get a game over (there are other ways to get a game over, in total the game has 20 different endings). So it’s important to do your job well. Alright, you can have food and medicine today, but no heat. I need the money to upgrade my booth and apartment. On day 2 things become more complicated, and foreigners may enter as well so long as their passport is valid. On each passport you have various things to check for, a valid issuing city, that their photo matches their physical appearance, and that it hasn’t expired. As the days go on more documents and rules will be introduced. I won’t go over all of them, but you will also have documents for entry permits, work permits, and you’ll need to cross-check the name and passport number (as well as other information) on these documents with what’s printed on their passport. Sometimes you’ll also need to fingerprint an applicant, or search them for weapons or contraband (can’t let the drug smugglers and terrorists in). You’ll need to go over the documents carefully, pointing out discrepancies, and even giving a proper reason for denial. On occasion you’ll need to detain some of the applicants instead of simply denying them entry. That about covers the basics of the game, so let’s move on to the graphics. They’re done in a simple pixel style, they’re not anything fancy, but they are pleasant to look at, and they help set the dreary mood of the game. And it is quite dreary working this sort of job in an oppressive country, barely making enough to care for your family and survive. The music is good, and helps compliments this mood, as do the sound effects. My main criticism of the game is levelled at trying to point out discrepancies. Now, it’s not that I have issue doing this, I enjoy it. No no, my issue is that while you know which rule is broken, it’s not always clear how to properly point this out. Once you do figure it out, it’s a non-issue the next time you must deny someone entry for the same reason, and it’s not an issue most of the time. But it happens occasionally, and there’s not really a good reason for it. You don't always have to point out the discrepancies, unfortunately this isn't clear from the game itself either and I didn't learn it until after completing it. There does come a point where it is necessary though, and even when it's not, doing so can be beneficial when you're uncertain if something is a discrepancy or not. In the end though, Papers Please is a fantastic game. If you’ve not played it yet, hopefully I’ve been able to convince you to give it a go. If you’re on the fence, I urge you to gamble on it anyway, wait for it to go on sale if you wish, just make sure that you do play this game.